AZ: Here's NBC's wrap of Martha McSally's easy victory last night. It'll be Ducey vs. David Garcia for governor. Who will replace McCain? 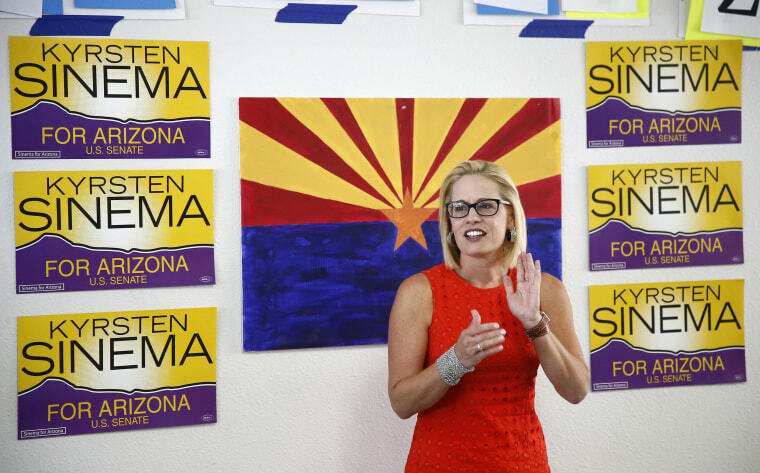 Doug Ducey wants Cindy McCain's approval of his pick, POLITICO writes. Ann Kirkpatrick ended up dodging defeat in AZ-2. And Arizonans were in the mood to toss some statewide incumbents, writes the Arizona Republic. FL: NBCs Alex Seitz-Wald sums up last night's big upset by Andrew Gillum vs. Gwen Graham. The New York Times looks at how Gillum engineered his improbable win. And don't miss a timely look from the Washington Post at Florida's environmental issues. And Donna Shalala is well positioned to win in November in FL-27, writes the Tampa Bay Times. NC: It's a mess in North Carolina as legislators try to sort out what to do after a judicial panel's ruling on gerrymandered districts in the state. NM-SEN: Rand Paul is endorsing Gary Johnson. TX-SEN: Ted Cruz's allies are sounding the alarm, writes POLITICO. VA-7: It's becoming an all-out war between the Congressional Leadership Fund and Democratic candidate Abigail Spanberger over whether the GOP group illegally obtained her security clearance paperwork. VA-10: Gabby Giffords is up with her group's first ad of the cycle, taking on Barbara Comstock on guns. 2020: Dave Catanese writes for The Atlantic on how Bernie Sanders and Elizabeth Warren are approaching potential runs for presidency — and how both think there's only room in the primary for one of them. And Koch groups are spending $6 million on a major ad buy to help GOP Senate candidates in Tennessee, Missouri and Wisconsin. The Washington Post writes that Trump privately revived the idea of firing Jeff Sessions this month. In a closed-door meeting, Trump warned evangelical leaders of violence from the left if Republicans lose in November. Here's our Hill team on the controversy over whether to rename the Russell Senate Office Building for McCain. POLITICO looks at how Stephen Miller has taken over the White House's immigration policy. Trump tweeted last night — without citing evidence — that the Chinese hacked Hillary Clinton's email server.